Cooling off with a frosty beverage on a sweaty LA day is great and all, but obviously, sipping that beverage poolside makes for an infinitely better day. 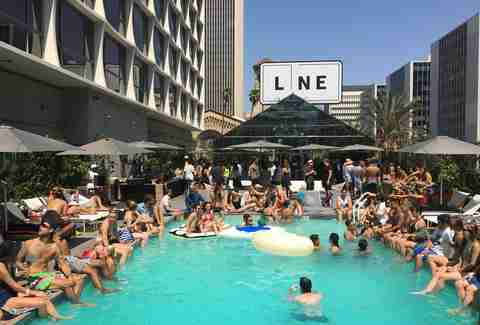 To help you in your quest for infinitely better (and cooler) days, we’ve rounded up (we think) every last bar with a pool in Los Angeles. You’re welcome. Open to guests and non-guests renting a cabana Friday through Sunday with DJ Skemaddox and guest DJs turning out everything from house to indie jams. A newly expanded menu for summer features hits like grilled octopus tacos and cocktails like the Copper Passion -- a heady mix of passion fruit purée, vodka, and a rosé cava float served in one of those sweet two-piece pineapple-shaped copper tumblers. 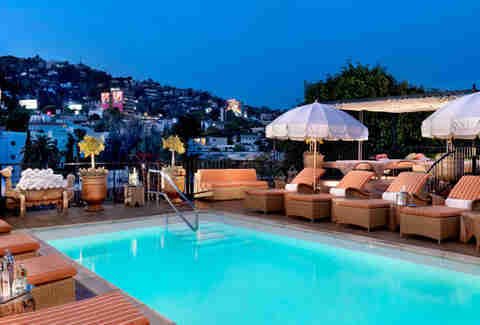 Lovely views of Beverly Hills, and an immaculately kept-up roof with a classy and breezy patio, with BBQs and oysters. The pool is open to guests (staycation, anyone?) 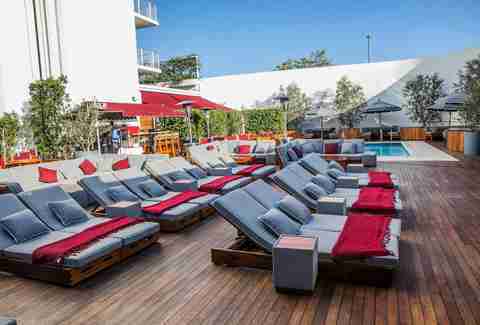 and features swank cabanas decked out with TVs, fans, Wi-Fi, and anything else you’d need to forget about the world beyond poolside livin’. Lounge chairs, a cafe-style restaurant, a six-seat bar, tropical cocktails, and smoothie shots. If you’re looking to get closer to the Mediterranean-style pool, guests and non-guests can rent lounge chairs, daybeds, and private cabanas that include lunch, bubbly, and more perks. 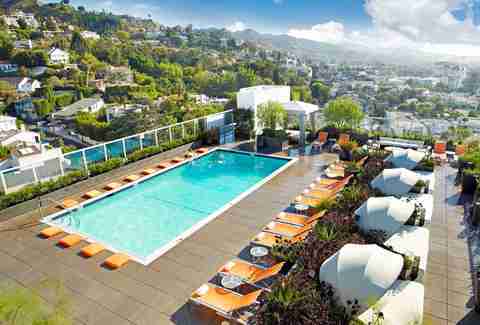 Panoramic views of the Hills with lounge chairs, cabanas, and cozy nooks surrounding a heated pool. You can order up solid menu highlights from Caulfield's like a raw bar platter or short rib sliders and refreshing cocktails like The Crisp with tequila, serranos, basil, and cucumber. Catch outdoor flicks on Wednesday nights this summer, as well as weekend pool parties, a Sunday rosé brunch, and more. An ultra-posh, relatively new hotel open to guests and “locals" on Tuesday nights. You can also rent a cabana on other days if you’re not a guest. Locals can join every other Tuesday for their “Spritz Social,” which features new Italian spritzer cocktails, classic Cipriani bites, life-size Jenga, ping-pong, corn hole, and DJs. Also: summertime movie screenings take place on the alternating Tuesdays, where you can sip cocktails and order from their menu while viewing poolside. 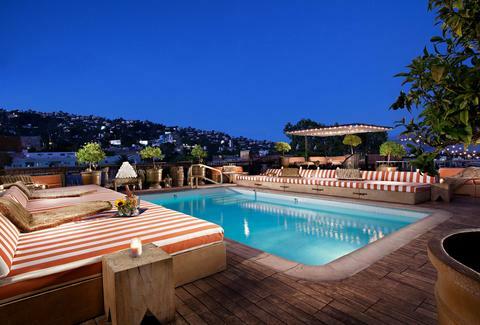 This vintage oasis recently received a colorful makeover and its shapely pool offers a chill retreat with '50s-inspired seasonal cocktails and knockout dining options from Viviane. Chow poolside on brunch and Bloody Marys, hit up their Sunday oasis pool parties with a DJ, rent a cabana for the day, or sip cocktails at night. Potent Tiki cocktails from the legendary Trader Vic’s poolside lounge, rentable pool rafts, and loads of old Hollywood charm and memorabilia. Swing by for Mai Tai Mondays for 50% off the classic potion. Oh, and they have the largest pool in the neighborhood and it’s heated year round, though you’ll have to be a guest or book a spa day to take a dip. "Beds" that you definitely shouldn't shine a black light on, a heated pool, a dance floor with nightly DJs, and bar bites like bacon-wrapped corn dogs. Also, unbelievably attractive people. The party kicks off early at 2pm on Summer Fridays with music, drinks, food, and more. It may not be the biggest pool in town, but it’s easily one of the best views around. Inspired by the completion of the Expo Line, their new summer cocktail menu features boozy mixes inspired by famous public transit systems around the world and neighboring cultural institutions. New bites include pretzel dogs, shrimp tacos, and Jeni’s ice cream sandwiches. Swing by Mondays for movie nights with free popcorn and $7 cocktails, or Mon-Fri happy hours from 12pm-5pm with $1 oysters, $5 Tiger beer, and $5 Hoxie spritzers. 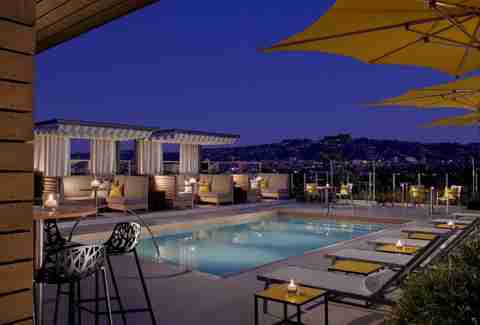 Scope out killer views from this swank poolside bar, which is open to non-guests through Labor Day weekend. Plus, on the last Friday and Saturday of the month, they’ll be screening '80s classics like E.T. and Raiders of the Lost Ark. Get bubbly with champagne floats, farm-to-glass cocktails, and sangria while chowing on upscale BBQ classics with an Asian flair like confit pork belly sliders and Thai-spiced grilled corn. A total scene at night and a pretty chill vibe during the day, with added-bonus celeb-spottings (we saw Iggy Pop going for a swim once!). Sip cocktails from their new lineup, which includes film-inspired libations from The Big Chill to Boogie Nights, and order eats off their extensive menu while admiring the David Hockney artwork at the bottom of the pool. 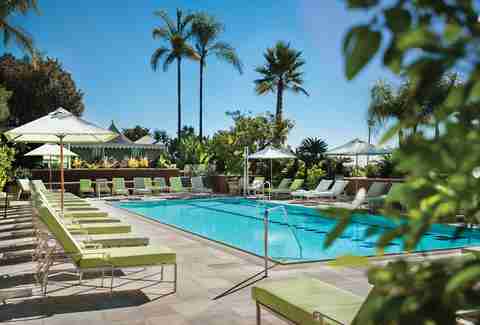 After 12pm, non-guests can rent out poolside lounge beds as long as they’re willing to shell out for eats and drinks. A swank crowd and a citrus tree-lined pool deck with top-notch cocktails and bites from the greenhouse-y environs of Roy Choi’s restaurant Commissary. The pool is open 10am-7pm for guests only, but non-guests are free to join for drinks in the evening and hit up the ping-pong and foosball tables. 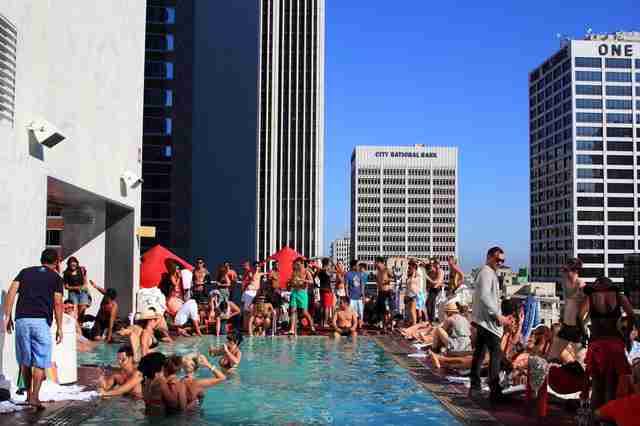 Pool parties and fashionable pop-ups occasionally take over on the weekends, so be prepared for a list. Planes overhead, cool water down below. Grab a brew or craft cocktail and perch above the pool or get cozy by the fire pit. 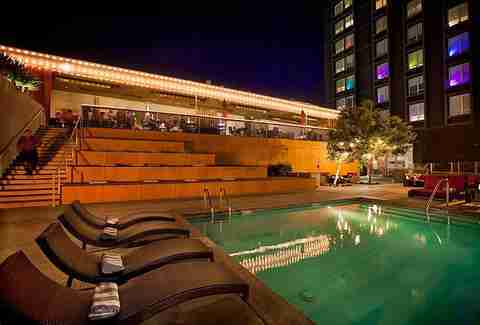 Though if you’re looking for a chill pool bar experience, weekend nights are probably to be avoided. They say it's guest-only, so your guess is as good as ours... though the (almost) 360º view is pretty stellar. Rooftop dining and drinking is open Saturdays and Sundays 12pm to 7pm. During the day, the bar's open to anyone; they say the pool's guest-only, but if you buy a couple drinks, our theory is that they'll look the other way. You can also hang on the poolside patio and order up breakfast, lunch, or dinner. Or just stick to the liquid diet. Shockingly great views, a shallow yet stylish pool, and roaring fire pits. You’ll also find quality cocktails and way-better-than-average poolside bites from Chef Eric Greenspan. A recently renovated pool bar open 11am to 11pm, and access to one of the biggest pools in the valley, which is available for non-guests if you register with the hotel. Order up a mojito and some bar bites and kick back for the day. After a recent and stellar upgrade, The Garland maintains its old Hollywood charm with a great mix of retro and modern style. As a non-guest, you can sip drinks and eat at the pool-adjacent Lobby Bar or play a round of foosball outside, but if you want to take a dip, catch a classic film poolside during Dive-In movie nights, or hit up the occasional taco cart out there, you’ll have to be a guest. A view of the Santa Monica Pier, and if they're feeling saucy, a reprimand for swimming if you're not a guest. At night, warm up by one of the bar’s 13 fire pits with an ocean view and order up a drink and a bite. Near-to-ocean swank, a great wine, and cocktail selection, and an elevated street food menu. Unwind in the Cast Lounge and bunker down in a cabana if you’re feeling like a baller. Access to the pool is yours... if your bar bill tops $35. Which should be no problem. Enjoy sweeping views of the beach and pier, happy hour deals during the week from 4pm-6pm, and a DJ on Saturday nights from 8pm onward. 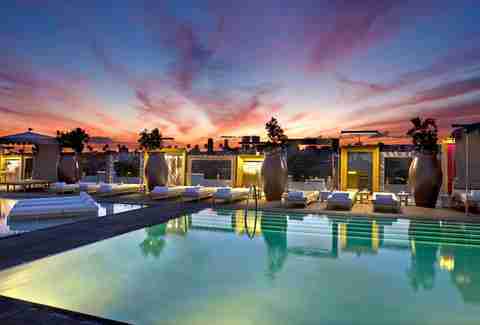 This glowing rooftop pool can get a bit scene-y on weekend nights, but the jaw-dropping views are worth the visit. As an added bonus, swing by Monday nights this summer starting at 8pm to catch the Dive-In movie series, which you can watch poolside or while swimming. Lounge-y cabanas and dudes who are probably from Europe. And their girlfriends. Pool access is for guests and non-guests who purchase limited day passes. Chill on the blue astro-turf deck or challenge someone to a game of ping-pong. Just maybe not the European dudes’ girlfriends. 360-degree views, if you can sneak in -- it's guests (and guests of guests) only. Once you’re there, expect secret garden-like nooks, roaring fireplace, and movies under the stars -- basically, scoring a visit will definitely be worth the effort. Panoramic views, classy poolside cabanas, food and drink specials on Mondays, and #RoseAllDay on Tuesdays. Probably not actually any Brits. It's "guests only" at this rooftop bar with an amazing view, but an elevator'll take you up there, and we're not telling anyone if you happen to slip in... And if you’re looking to pop bottles poolside, programming includes Sundeck Sessions featuring DJs and bottle service through the summer. 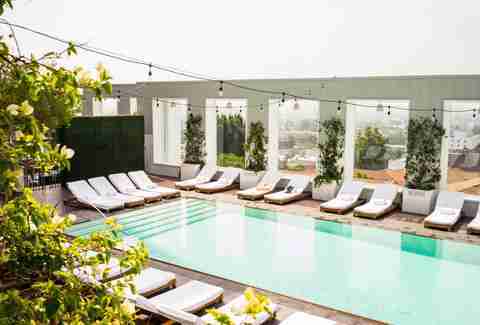 A super-mellow hideaway at one of LA's best-kept secrets. Sorry, one of LA's previously best-kept secrets. And if you get the crew together (15 people at least), you can take over the sound-system with your own playlist for an hour every Sunday to Wednesday, 8pm to midnight. Great burgers and drinks at the bar and in cabanas, with occasional weekend night and Sunday parties that are often promoter-listed or RSVP-required. The recent addition of a camouflaged airstream trailer bar adds to the colorful vibe of this hidden oasis as do happy hour deals from 4pm-7pm, Mon-Fri.
Jeff Miller is Thrillist LA's Senior City Editor and Danny Jensen is a Thrillist LA contributor, and both of them agree: all bars should be pool bars. Follow 'em on Twitter (Jeff here, Danny,) and Instagram (Jeff here, Danny).